Are inhalers the best solution? One of the aspects of asthma and allergy treatment we discuss in The Allergy Book is the important of lifestyle changes. Inhalers certainly help reduce asthma symptoms when needed, but to solve some of the more underlying causes requires a deeper level of intervention that doesn’t always have to involve medication. A new study in India supports our experience. 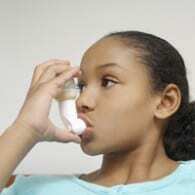 156 children with asthma were studied. The parents of infants with asthma were told to follow some modifications in feeding and sleeping that were designed to avoid choking on liquids or food and to minimize aspiration episodes at night while asleep. Smaller, slower, more frequent feeds and elevating the head of the bed during sleep were advised. Healthier, home-made cooking was also advised. I realized that this is a huge issue for me. I often try to drink water too fast and partially choke on it sometimes. At least once or twice each morning a sip of my coffee goes down the wrong way. These seemingly-minor incidents really take their toll on my breathing, causing me to cough, wheeze, and clear my throat for the next few hours. I find that if I’m more careful and can avoid these partial choking episodes, I don’t have such problems. So how much can such issues affect infants and children with asthma? According to this study, they can affect kids quite significantly. The take-home message is this: if you have an infant or child with asthma, not only is healthy eating important, but drinking carefully, nursing or bottle-feeding carefully, and elevating the head-end of baby’s sleeping surface slightly to minimize coughing and choking episodes may have a beneficial effect on daily asthma symptoms. I would say this is definitely true for me.